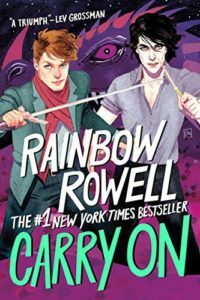 First off, let me say that Carry On by Rainbow Rowell is not Harry Potter fan fiction. There are a ton of parallels. Simon, the main character, is the “Chosen One.” He was an orphan. He is attending a school for magicians in England. His roommate Baz, and the start girl in his class Penny, are the titanic trio around whom the story centers. There is a headmaster, the Mage, who takes Simon under his wing. There is an arch villain who is attacking the world of magic. On the flip side, the way magic works is different, Simon and Baz spent their first years at school fighting, there is a gay love affair, and a whole lot of snark. In fact, the highlight of the first half of the book was the clever snarkiness. There was not a lot of action in the first half of the book. The story starts with the senior year and there is a lot of retrospective, filling in the back story, that takes place before the action begins. Once things really start rolling then I found the story engaging and was eager for the next chapter. By the end, I thought it was a creative story, but I was not totally happy with the ending. Simon, it seems, just has to carry on. Euan Morton was the reader. At first I thought the narration was a bit quick but soon my consciousness of the narration fell into the background, which is a sign of a job well done. I may not have made it through the first half of the book were I reading a paper copy of Carry On.